Vancouver Lawn Tennis & Badminton Club was hosting its 40th annual senior tournament March 31 to April 9, 2017. This was an ITF event. For the tournament results click here. 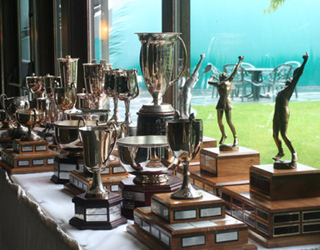 BCTENNIS.COM is pleased to bring to you our coverage of the Vancouver Lawn Masters Indoor Championships. what went wrong this year? . . .
Players had to validate their membership with the new national membership system . . . Here they are in action . . .
A warm-up for the Senior Nationals, this year attracted a record number of 391 players . . .
Four new categories introduced - Men's and Women's 30, both singles and doubles . . . The women's 45 doubles was the most popular category . . .
85-year-old Lou Wynick, a true tennis veteran, was competing in Men's 80 Singles . . .
Russ Hartley and Patrick Macken, above left, beat Bob Bardsley and Don McCormick . . . The weather played tricks on the tournament, players sweltered in the bubble . . .